Treasure Island Hotel & Casino (also known as “TI“) has 2,664 rooms and 220 suites, and is connected by tram to The Mirage as well as pedestrian bridge to the Fashion Show Mall shopping center. Since March 2009, TI is owned and operated by real estate investor Phil Ruffin. The hotel has received the AAA Four Diamond rating each year since 1999. Casino: Yes, 95,000 square feet. Casino games include Blackjack, Roulette, Caribbean Stud, Pai Gow, Spanish 21, and Baccarat. 2,158 Slot and Video Poker Machines. The TI Poker Room features an intimate lounge atmosphere which includes eight non-smoking poker tables. Race & Sports Book: Yes, a 152-seat race and sports book, equipped with 23 televisions and 10 big screens. Restaurants: Treasure Island has the following dining options: Isla Mexican Kitchen & Tequila Bar, Phil’s Italian Steak House, Kahunaville, The Buffet at TI, Canter’s Deli, Gilley’s Saloon, Dance Hall & BBQ, The Coffee Shop, Khotan,Pho, Pizzeria Francesco’s, Starbucks and Ben & Jerry’s. Entertainment: Entertainment includes Cirque du Soleil’s Mystère and visiting headliners. Nightlife: Gilley’s Saloon, Dance Hall & BBQ is a country music dance club and restaurant. There are also several bars. Attractions: Yes, the Sirens of TI — a free show. Pool: Yes, one outdoor pool and a “Party Tub,” a 50-person Jacuzzi. Health Club or Fitness Equipment: Yes, a fitness center is located in the spa. Spa: Yes, Oleksandra Spa & Salon. Shops: Yes: The Mystere Store, Scene, Siren’s Cove Shoppe, Lobby Store, TI Gift Shop, Pearl Factory, $10 at TI, Cashman Crystal, TI Bling Co., 100 Degrees and Gilley’s Trading Post. Wedding Services: Yes, the Wedding Chapels at Treasure Island offers a number of wedding ceremony packages. Convention Rooms: Yes, 18,000 square feet total. In-Room Internet Access: High-speed internet access available in all rooms (for a fee). Shuttle Service to the Strip: There is a monorail between Treasure Island and the Mirage. Standard Room Amenities: Hair dryer, iron and ironing board, alarm clock and radio, remote-controlled flat-screen cable TV, air conditioning, desk, electronic door locks, in-room safe, high-speed internet access (for a fee), pay-per-view movies, telephone, voice mail. Incidental Charges: Treasure Island requires a credit card or a cash deposit for incidental charges. 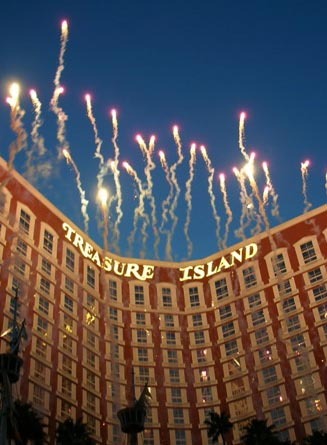 Treasure Island has a $20 per room, per night resort fee, which covers the cost of in-room high-speed Internet access, 2-for-1 lunch buffet (Mon – Fri, one per stay), 2-for-1 cocktail per stay, fitness center entry, in-room local and toll free calls, VIP viewing of the Sirens of TI, daily newspaper at Guest Services, printed airline boarding passes at Guest Services, and some business center services. This fee is not included in your reservation and will be charged at the hotel. Some hotels also apply tax to their fee.